I really love the English wine industry. I find it both intriguing and charming and I never tire of hearing, normally with a note of surprise, how someone or other had a bottle of English fizz the other day and how delicious they thought it was. Because it is Sparkling Wine on which we are solidly building our reputation as a country that is able to produce a high quality product, capable of competing with the best that Champagne has to offer. 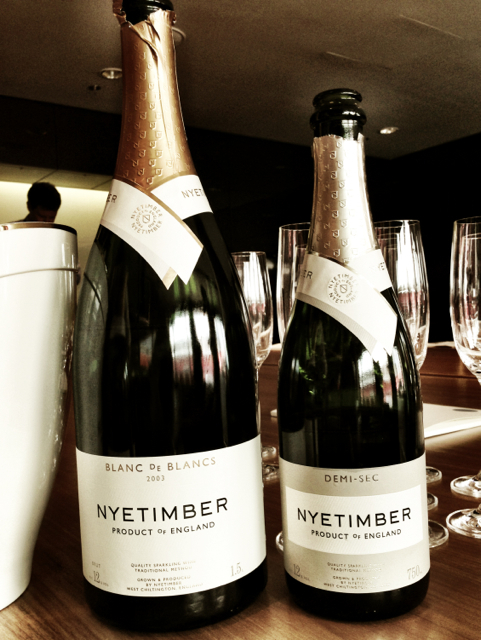 One such producer is Nyetimber who have been making fizz for over 20 years. They are based in West Sussex near Pulborough, about 15 minutes away from where I grew up. The reason that English fizz can be compared directly with Champagne is because it is made in exactly the same way; the same grapes are used – Chardonnay, Pinot Noir and Pinot Meunier – as are the same vinification techniques. Perhaps most importantly the exact same strain of chalk that runs through the soils of Champagne continues under the channel and through the vineyards of Kent and Sussex meaning the terroir can be almost replicated. You will no doubt have heard rumours of blind tastings where an English Sparkling Wine has beaten the best of what Champagne has to offer and fooled all the experts into thinking it was the real deal! Well it’s all true! 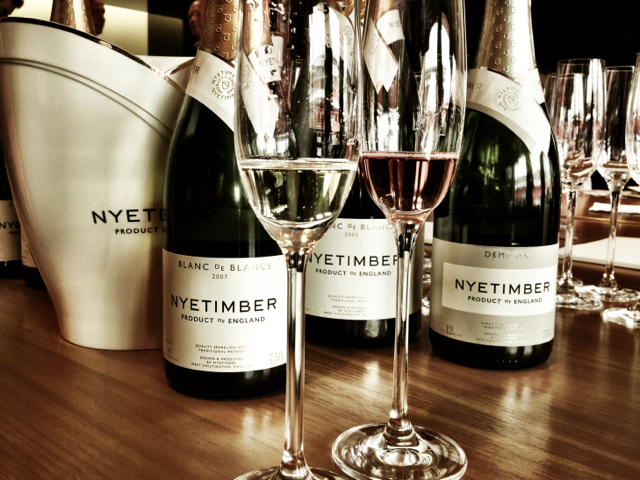 Nyetimber produces a Classic Cuvee, Blanc de Blancs, Rose and more recently a Demi-Sec. Interestingly each Classic Cuvee is made as a vintage wine rather than the more common non-vintage (NV) in Champagne. This is a brave move as although it means you can end up with an outstanding wine in a good year, it means there is nowhere to hide in a bad one. And there are plenty of bad years in the UK! In fact last year Nyetimber (and I believe they were alone in doing this) scrapped the entire vintage and publicly announced that they would not produce any wine from 2012. As I said, a brave move. 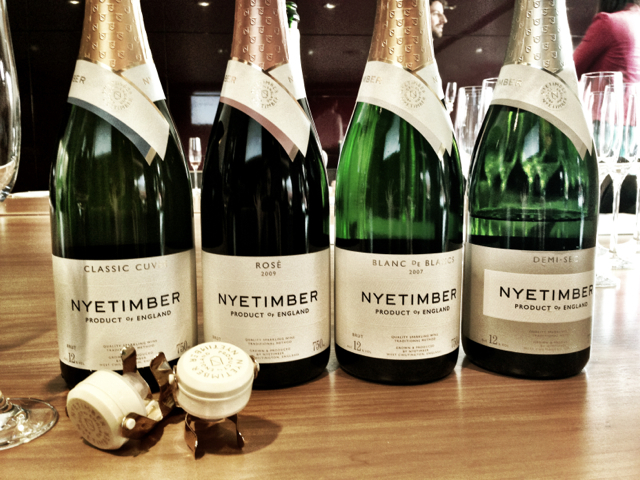 What sets Nyetimber apart is that they have pitched themselves at the luxury end of market. Having gone through a recent rebranding their products certainly look the part and have price tags to match. They, perhaps wisely, have chosen to compete with high end, well recognisable Champagne brands rather than trying to slip in as the cheaper offering. I will be very interested to see how this works out for them as sadly the vast number of Englishmen and women would rather spend their hard earned money on a Champagne they have heard of (which therefore must be good) rather than an arguably better quality English Sparkling Wine. We had the pleasure of trying the Classic Cuvee 2005 and 2004, the Blanc de Blancs 2003 and 2007, the Rose 2009 and the Demi-Sec. As suspected the difference in vintage really shows – for me the Classic Cuvee 2005 was the best; it had a creamy nose with a lovely round body and without the overwhelming acidity you can sometimes find with English wine. The 2004 was much more citrusy and just not quite as good. Similarly the 2003 Blanc de Blancs was way better than the 2007 and had great fruit concentration and a very good length. Apparently it won ‘best Sparkling Wine in the world’ in 2009 which is quite an achievement. The Rose was pleasant enough with a nice body but lacked any real depth of flavour which was a shame as I have really liked this wine in the past. The Demi-Sec was popular with everyone; a nose of passion fruit and a lovely nutty sweetness that balanced well with the acidity. Overall I though Nyetimber were very impressive and they are obviously running a very slick operation. I wish them well against the big guns in Champagne and look forward to many more years to come of an English Winery winning the best Sparkling Wine in the world. It is quite a spectacle going out to lunch with my family. There are so many of us (I have 2 brothers, 2 sisters and between us we now have 3 plus ones in tow) and inevitably end up slightly taking over every restaurant we ever go to leaving me feeling faintly sorry through the haze of alcohol for the other folk there who were probably looking forward to a nice quiet luncheon and who through no fault of their own and some horrible twist of fate ended up next to us. 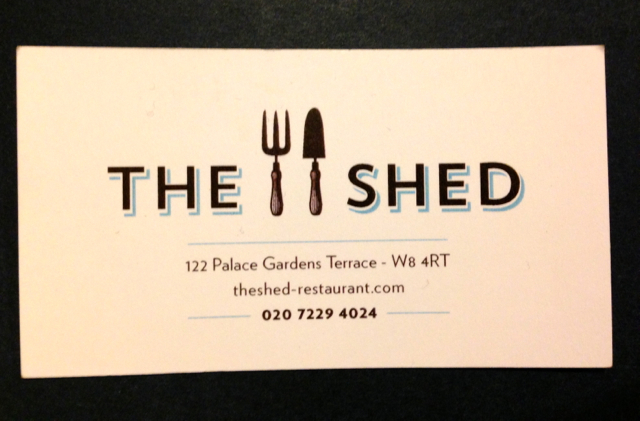 On this occasion (my sister’s birthday) we took our noisiness (and discerning palates) to The Shed in Notting Hill. For me, as a concept, The Shed rather symbolises ‘living the dream’. The two guys who run it hale from Sussex not far from where I grew up and they source the majority of their produce either from their younger brother’s farm or other local farmers. 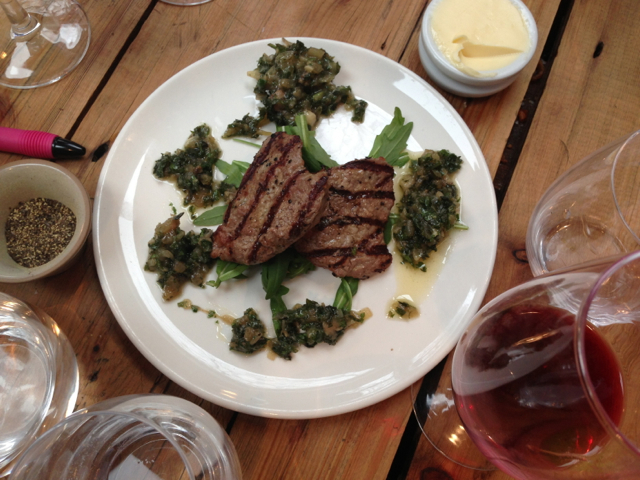 The menu changes daily depending on what’s available and it makes you feel like jumping up and down on one of their kettle drum tables singing ‘The Circle of Life’. And it’s all very farmyard themed – the top of their bar is made out of what looks like the bonnet of a John Deer tractor and there’s tractor wallpaper in the loo. The other chap in the restaurant celebrating his birthday (who had obviously had the forethought to tell them in advance) had his birthday cake ‘rung’ in to the room with a cow bell! All this would be incidental if the food wasn’t good. But it was SO GOOD! The kind of good that means we all sort of couldn’t cope with how good it was. We were at first slightly confused by the menu but had it gently explained to us by our extremely patient waiter – it’s all about small plates here, like tapas but English. This is bad news if you’re not good at sharing but really good news if you’re looking at a menu (like we all were) thinking there is no heavenly way in the world you would ever be able to pick two dishes out of all this deliciousness. As it was we ordered 13 out of the possible 16 dishes (they are split into two categories of ‘Slow Cooking’ and ‘Fast Cooking’) and many of these we doubled up on. Highlights were the Lamb Chips – slow cooked lamb pulled apart and put back together into a ‘chip’ shape, rolled in bread crumbs and crisped up in the deep fat frier. The Scotched Mozzarella and Veal made us all literally all bend forward in unison and go ‘Ooooooh’ before having to up our order to 3 portions. The Veal Medallions with Bone Marrow Pesto almost made my father fall off his chair with excitement and for me the Hake with Fennel Ground Pork, White Beans and Wild Garlic was one of the best dishes I have had in a long long time and had me reaching for my notebook to try and remember to recreate it (in my dreams) at home. Even the desserts (yes we had room, just) were phenomenal – all twists on old favourites – Rhubarb Jelly with Crumble Ice Cream, Hot Cross Bun and Butter Pudding and Magnum Vienetta Parfait. I am still not genuinely sure what a parfait actually is (it always makes me think of Donkey from Shrek – you know the scene) but all I know is I would eat that for dessert every time I went out for the rest of my life and die a happy (yet rather portly) woman. I never actually saw a wine list but the house red and white (a Merlot and a Languedoc blend respectively) kept us happy throughout the meal. I believe they serve ‘Nutty Nutbourne’ as their house fizz which is certainly worth a try if you have any interest in English Sparkling Wines and if you don’t, shame on you, you should and it’s time to get on board. Please bear this place in mind the next time you go out. 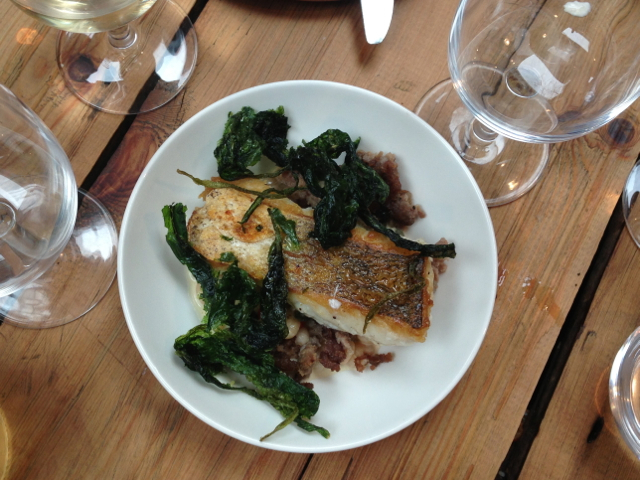 It really was one of the most fun lunches we had all had in a long long time. It is informal, relaxed but attentive service. 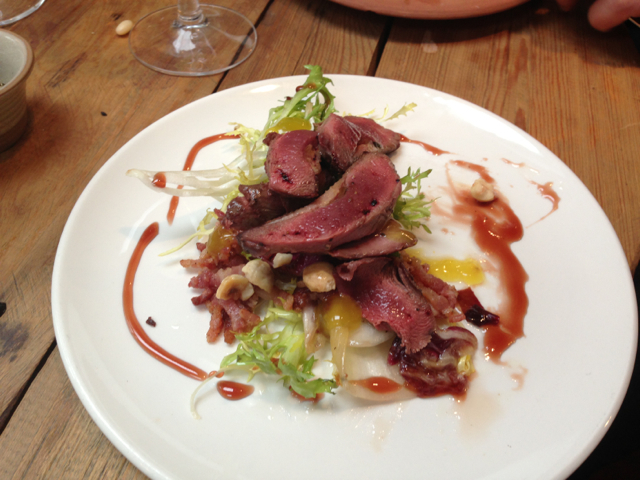 The food is brilliant and exciting and delicious but without being fussy or poncy. I can’t wait to go back and I only hope that living the dream is as good for them on the inside looking out as it seemed to me from the outside looking in.